THE largest movable wicket dam in the world and the only one built entirely of concrete and steel has just been opened for business in the Ohio River near Cineinnati. When the steamboat Indiana passed through the lock on July 20th, as here shown, the event marked the completion of a six years task 111 building one of the most remarkable dams, indeed, the only structure of its kind. No other dam is built entirely from concrete and steel. There are 60,000 cubic feet of concrete in the structure, of which 35,000 feet is under water and cannot be seen at any time. All the gravel, sand and crushed stone used in this vast amount of concrete was excavated on the site of the big dam when dredges scooped out the rivers sandy bottom down to bed rock where all concrete footings are planted. The foundation for the dam proper extending across the river is of concrete and steel and arranged so that the movable wickets work independently of each other and may be removed like so many pegs from so many holes. 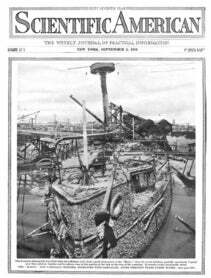 The one illustration shows the government dredge boat beginning to stand the wickets in lJlace in their sockets on the bed of the river. The long line of wickets forms the dam to hold baek the water. The mechanism 01 the dam allows these movable wickets to be dropped flat npon the bottom of the river bed or raised at will by means of compressed air. Thete movements are controlled from the Ohio shore. The working of the dam proper regcl-lates the height of water in the 25"rile pool above it. When the river is high Dnd there is no need of the artificial stage of water the wickets are lowered fat on the bed of the river and craft pass over as if no dam were there; but when the water is low and the stage of water is artificially formed above the dam the craft must pa3s through the lock on the Ohio shore from the higher or lower stage, or from the lower to the higher, according to the direction in which the boats are traveling, as illustrated in the photograph showing the steamer “Indiana” passing up stream through the lock canal along the Ohio shore. The government has appointed four lock keepers to transfer these boats through the big dam. These men work in shifts. That the big Fernbank dam, known offcially as No. 37, is a big success may be gleaned from the fact that the United States government will build others like it in the Ohio River to make that stream navigable the year round from Pittsburg to Cairo, a distance of more than a thousand miles. It is a step completed to establish a- permanent stage of not less than nine feet of water in the Ohio River the year round. This clam located at Fernbank, Ohio, tWElve miles below Cincinnati, will give Cincinnati a permanent minimum stage of nine feet of water for a distance of 25 miles. It cost the government &dollar;1,500,000. l&apos;arly in, September people of the Ohio Valley will gather .in Cincinnati and the structure will be officially dedicated. The Pebble Industry A PECULIAR form of mineral wealth is found on Plum Island and GOOS2 Island, two of a row of islands lying between the northern point of Long Island and Watch Hill. It consists in heaps of richly-colored quartz pebbles, showing re&apos;, yellow, purple, and other hues, which are locally called agates. They are used in making stained-glass windOWS, and there is a suffeient demand for them in New York to keep the owners of one or two sloops employed in gathering them from the beaches, where the waves continnally roll and polish them, bringing out the beauty of their colors.